In November 2013, a study was published in the Proceedings of the National Academy of Sciences that examined pertussis vaccine's ability to prevent transmission of the bacteria. In "Acellular pertussis vaccines protect against disease but fail to prevent infection and transmission in a nonhuman primate model", Jason M. Warfel and his colleagues at the U.S. Food and Drug Administration's Center for Biologics Evaluation and Research compared disease symptoms, colonization and transmission in acellular pertussis (aP) vaccinated, whole-cell pertussis (wP) vaccinated and unvaccinated infant baboons, as well as among previously infected (convalescent) baboons. The researchers took infant baboons and immunized them according to the same schedule as humans, at 2, 4 and 6 months. At 7 months of age (i.e., 1 month after vaccination or 1-2 months after recovery for non-naive animals), the baboons were then exposed to pertussis. wP-vaccinated, aP-vaccinated, and convalescent animals did not cough and showed no reduction of activity, loss of appetite, or other outward signs of disease. So far, so good. This reinforces what we know already: the vaccine prevents clinical disease in the immunized individual. From a patient-centered point of view, that is great! Infection can lay a person low for months, not to mention lead to broken ribs or even death, all from the unrelenting cough that wracks the entire body. Now for the less welcome news. As I noted above, animals that had previously been infected with pertussis not only showed no symptoms, but also resisted colonization, but not so among vaccinated and naive baboons. aP-vaccinated and wP-vaccinated primates had lower initial colonization than naive animals, but wP-vaccinated baboons cleared the bacteria twice as fast as the other animals. Furthermore, the authors tested this finding by housing two aP-vaccinated and one unvaccinated baboon with a fourth unvaccinated animal that had been directly challenged with pertussis. All three animals had similar colonization levels and patterns of growth and clearance. The authors further hypothesized that since aP vaccine does not prevent colonization, that it might not prevent transmission, either. To test this, two aP-vaccinated animals were challenged with pertussis and placed in separate cages. After 24 hours, a naive baboon was placed in each cage, and both were infected by their vaccinated cage mates. The implications of this study are that pertussis vaccination might not prevent transmission of the disease to unvaccinated individuals, even though it does prevent the disease itself in the immunized patient. I say "might" because the study has a number of limitations. First off, it was a very small study. There were only 3-4 animals in each group (aP-vaccinated, wP-vaccinated, convalescent and naive), so it is possible that the results may not hold up in a larger population. Second, the study was in non-humans. Although baboons are genetically very similar to humans, many elements of the immune response are species-specific. The results, therefore, might not translate to a human population. Further research in humans would be required to verify these findings, though there are some obvious ethical hurdles that cannot be overcome using the same design as this study. It's also unclear if aP-vaccinated animals successfully transmit the bacteria to other vaccinated animals or only to naive ones. The study suggests that this might be the case, but the authors did not test this, so we don't know if it is or is not a factor in outbreaks among vaccinated individuals. They also did not test whether or not animals immunized with the whole-cell vaccine transmitted the bacteria. [I]t is important to note that our data in combination with human data show that vaccination with aP provides excellent protection from severe pertussis (52). Therefore, any short-term plan for addressing the resurgence of pertussis should include continued efforts to enhance aP immunization. However, to protect the most vulnerable members of the population and achieve optimal herd immunity, it will be necessary to develop a vaccination strategy that effectively blocks pertussis infection and transmission. If these results translate to the larger human population, then it shows that we have tackled half of the problem presented by pertussis. We can protect people at the individual level through vaccination, but maybe not (or not as well) at the population level. Another study, published in December 2013 in the journal Clinical and Vaccine Immunology, found that there is a relatively new strain of pertussis that has become much more prevalent in recent years. 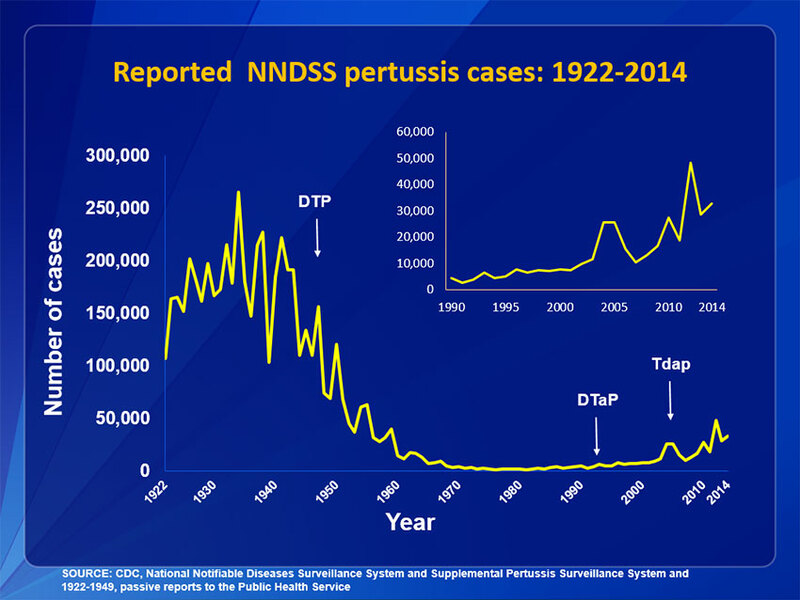 "Prevalence and molecular characterization of pertactin-deficient Bordetella pertussis in the US" describes the emergence of a strain of pertussis that lacks the antigen pertactin. This protein is on the surface of the pertussis bacterium and helps it stick to cells in your trachea, as well as aiding in its survival by keeping it from getting gobbled up by your own cells. 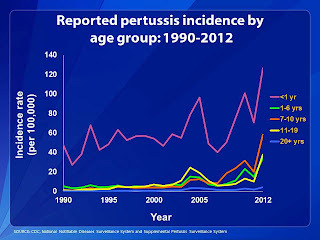 Pertactin-deficient (prn-) strains of B. pertussis had been noted in several different countries besides the U.S., including France, Italy, Japan and Finland, but, according to Lucia Pawloski and her colleagues, the timeline of the emergence and distribution of prn- strains had yet to be examined. That's what they set out to do in this study. 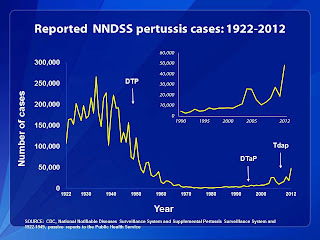 The researchers used 1300 isolates of B. pertussis from four different collections: 666 historical isolates collected from 1935-2009, 33 isolates from the 2010 California outbreak, 385 isolates from routine surveillance from 2010-2012 and 216 isolates from the 2012 Washington outbreak. 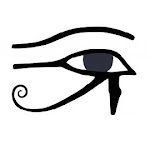 They screened for a known mutation, a prnIS481 insertion, in the gene that codes for pertactin, since it has been observed that bacteria with this mutation are pertactin-deficient. This allowed them to look for other mutations that could also lead to pertactin deficiency. Of the 1300 isolates examined, 994 (76%) had pertactin, while 306 (24%) were deficient, the majority of which (276 isolates) were prnIS481-positive. Of the 1300 isolates screened by prn PCR and/or later identified by Western blot and sequence analyses, 276 (21%) were identified as prnIS481-positive (Figures 1 and 2). Strikingly, only one (0.2%) prnIS481-positive isolate was found in the historic collection that dated from 1935 to 2009 (Figure 2A). This isolate was collected in 1994 from North Carolina, while the next prnIS481-positive isolates were observed in 2010 in both the CA outbreak and in the US 2010-2012 collection (Figure 2A). In the CA 2010 outbreak, only 2/33 (6%) prnIS481-positive isolates were identified. In the WA 2012 outbreak, over half (63%) of the isolates collected were prnIS481-positive (137/216 isolates). This observation does not appear to be a regional or isolated incidence, as the US isolates captured from 2010-2012, when stratified by year, also show a similar trend, with 14%, 40%, and 53% of the isolates being prnIS481-positive for years 2010, 2011, and 2012, respectively (Figure 2B). 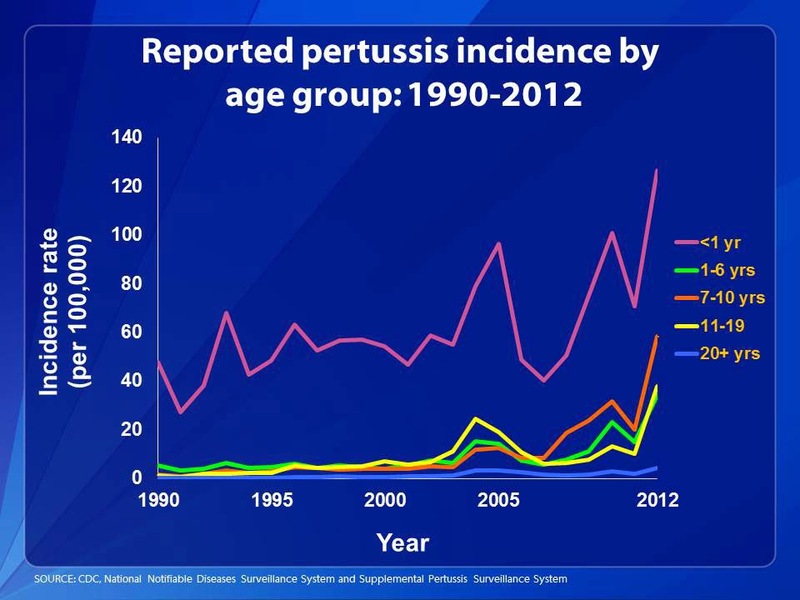 Pertussis, it appears, has undergone some evolution very recently. Between the prnIS481 insertion and the various other mutations that result in a lack of pertactin, the data pretty convincingly show that there is some advantage to the deficiency. On the one hand, a lack of pertactin means the bacteria is more likely to be consumed and destroyed by host cells. On the other, pertactin-deficient bacteria grow at a faster rate than pertactin-positive strains, at least in culture. This growth advantage may compensate for more easily getting eaten, but it is still not clear what is driving this selection. Bringing this back to the vaccine, one idea that has been put forth to explain it is that use of the acellular pertussis vaccine, which include pertactin as one of the target antigens, might be at least partially responsible. After all, if everyone who gets the vaccine develops antibodies against pertactin, then pertactin-deficient bacteria would have a significantly higher chance of survival than their pertactin-expressing relatives. However, Pawloski, et al., note a problem with this thought. The first known isolate appeared in 1994, and was likely in circulation to some degree before the acellular vaccine entered widespread use. It had only been approved for the fourth and fifth doses in 1991; it wasn't until 1996 that it was approved for the initial three-shot series. So the vaccine is unlikely responsible for the appearance of the pertactin-deficient strains. Furthermore, despite the acellular vaccine having been in use for well over a decade, it's only in the last few years, years in which outbreaks have occurred in those predominantly immunized with the acellular vaccine, that we see the increase in pertactin-deficient strains. While the vaccine might be one factor driving the evolution of the bacteria, it probably is not the only one. While further research is required to determine exactly why pertactin-deficient strains are increasing in the U.S., these findings do have implications for current immunization policy. We have entered a period where those who are most at risk of infection and transmission of the disease are also the ones who have received most or all of their pertussis immunizations in the form of the acellular vaccine. Since the currently licensed vaccines only include a few parts of the bacterium (pertussis toxin, filamentous hemagglutinin, and pertactin in all aP vaccines, as well as fimbriae types 2 and 3 in one vaccine), the loss of one of those antigens can lead to decreased effectiveness among the recipients. It is therefore crucial to monitor mutations like the one described by Pawloski, et al., to ensure that we can protect the population from highly contagious and dangerous diseases like pertussis. So just what are the implications of these two studies? Assuming that the baboon study's results translate to humans, the simplest conclusion is this: we need a better vaccine. The current acellular vaccine does offer decent protection; certainly it is better than nothing at all. But it may not be doing enough. One of the primary goals of any immunization policy is to protect the community, especially those who cannot be vaccinated. 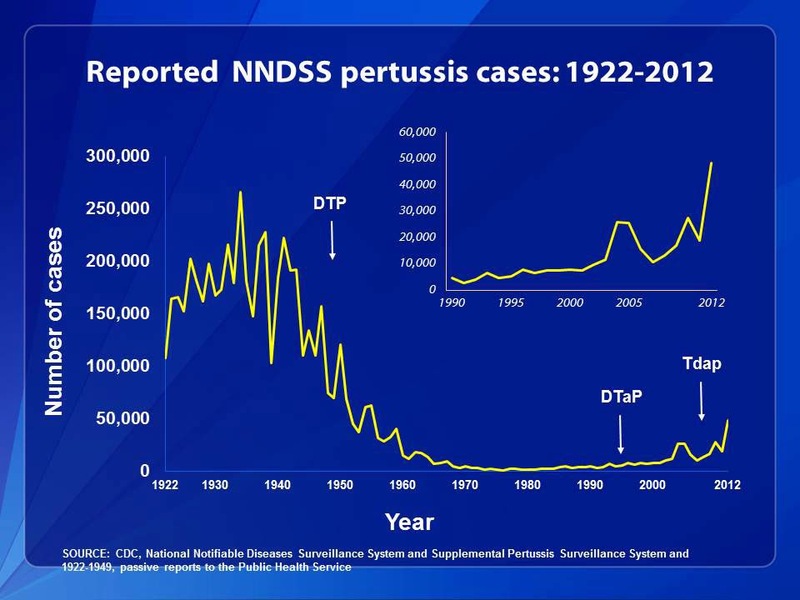 With pertussis, this is especially important when it comes to infants, for whom the disease is especially dangerous. We achieve this community-wide protection in two ways: first by preventing the disease in the immunized individual, and second by preventing those who are exposed from spreading the bacteria to others. The Pawloski study suggests that the current vaccine might not be doing as good a job as it could on that first count. The Warfel study in baboons suggests that it might not be doing as good a job on the second, assuming, again, that the findings apply to humans. (In light of the Pawloski study, I wonder if Warfel, et al., controlled for pertactin deficiency in the bacterial samples used to infect the animals.) Both studies prompt further research into the issues raised. As we see rising rates of whooping cough, with larger and larger outbreaks around the country, we clearly need to do better.